Moving after living in one place for 23 years. Preparing for an estate sale to sell off my previous antique business merchandise along with most everything in the house. Knee surgery due to moving. Traveling. Then throw in the birth of an adorable Granddaughter named Molly and it all makes sense. I am very happy with my new studio in my new home all thanks to Craig and our friend Alan. Hours of assembly required for clever IKEA storage carts, new tables and a new easel. All very good things to make the room as efficient as possible. It is not the large space I had hoped for and it does not encourage large messy painting…but the outdoors beckons for large projects. It is an honor to have two of my new pieces receive recognition. 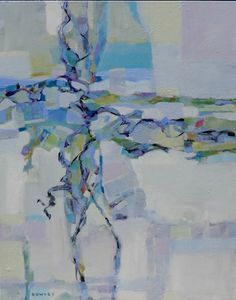 “A Mum for Mondrian” is a large acrylic joyful painting that was honored with a first place win in the Juried Irving Art Association’s Member show. This painting was inspired by Mondrian’s lovely mum paintings. While Mondrian’s paintings were soft and delicate, my work turned into a large impressionistic painting full of color. Color continues to be a wonder to work with and it will continue to challenge me in exciting ways forever. “Dancing Colors” is an abstract color project. My passion for delicate line work threads its way through the work while soft pastels in abstract shapes play across the canvas. It was a joy to paint and I am honored to have it accepted in the CAC’s upcoming 2017 Annual Membership Exhibition at the Mary Tomás Gallery in the Dallas Design District. Jurors are Mary Tomás of Mary Tomás Gallery, Donald Fowler, Director of Retail at the Nasher Store, and Reid Robinson, Community Arts Advocate. Working in abstracts has offered experimentation with shape, composition and color. My studio is filled with wet oil paintings in all shapes and sizes as this new avenue has kept me immersed in the creative experience. I hope you like this new direction. This painting brings me all the way back to my earliest passion for drawing. In college I spent hours drawing dried seed pods on paper. The organic shape of leaves allows endless artistic pursuits in line work and shape. Black lines in this piece were reminiscent of early drawings. At 24″ x 30″ this large painting was created with layers of colors and glazing. My goal was soft colors along with intriguing shapes achieved by tonal value. The surface was achieved with spontaneous brush strokes, rubbing hard, wiping off and scumbling. Title: “Salon Day” Acrylic on Canvas. 36″ x 48″. This large painting is going to be on display for sale at Studio 110 in Dallas. I painted it for a large space in the entrance of the salon. Please contact me if you are interested in this painting or any of those shown on my web page. Today was more “color play” for me. I think I will call this “Remembering Dad”. He loved the mountains. Rotator Cuff Surgery means a lot of physical therapy to get use of the arm and shoulder again. Watercolor has been my “go to” medium for some time as I am getting my arm strength back. But today I got out the oils and worked on this impressionistic landscape. It was a joy to paint as I love color. Shown below are a few of the small watercolors that I have painted just for the show to accent many framed oils and acrylics. I have found that painting in watercolor works well as I continue to mend from Rotator Cuff Surgery on my painting arm. I hope I will see old friends at the show and am looking forward to meeting new friends. Easing my way back into painting with Watercolors. Title: Best Friends. Trying out my new Apple Pencil on the Macbook Pro as my painting arm is healing. I am definitely a hands on painter – preferring oil on canvas. But as my arm heals I am trying an approach that lets me create and use my painting hand while it is in the sling. Thinking this might be my new “sketch book”. My Rotator Cuff Surgery went well on December 8th. I am halfway through six weeks in the sling. At three weeks the metal brace portion of the sling was removed. Just having that removed has improved my mobility and helped me feel much better. In a month I will start Physical Therapy. I am ready for that challenge as I am ready to paint again! The Opening Reception was wonderful. Great turnout, lovely ladies and girls dressed as Frieda-“uni brows” and all! I was thrilled to have my painting included in the Exhibit Brochure. Many wonderful works in the show and you can still visit it until January 30th! Farewell for awhile. A nasty fall many years ago is now wreaking havoc on my shoulder. So Rotator Cuff Surgery is on the schedule. Lots of physical therapy until I can paint again. Contemplating what my left hand will produce. Maybe I will share “left hand art” in a couple of months. Or maybe some photos? I do like photography…but steady photos with one hand could be questionable……. “Portrait Study in Limited Palette” is just that. A good exercise that offered me new insight in my painting in several ways. Continued exploration in color, value, along with that important exercise of “drawing”. And finally there is that wonderful experience of working with paint and brush. It all sounds so simple. But the painting must come together in so many different ways. “Stormy Seas” has been worked on quite a bit more. Adding more color to the sky and working on color and movement in the sea. Thinking I am happy with this painting. And I am most pleased that this vision came from a spark within…. inspired by the orange color coming from the underpainting. Abstract Painting is becoming more fascinating to me. I painted this piece after the latest terrorist attacks in Paris. As someone who paints with emotion I felt the colors and movement of the paint expressed the sadness of the day.